Location: Nemours, in the Seine-et-Marne departement of France (Ile-de-France Region). Notes: Château de Nemours located in the city of the same name in the far south of Paris in the department of Seine-et-Marne, is a fortress built in the twelfth century on the left bank of the Loing, at a former fording. 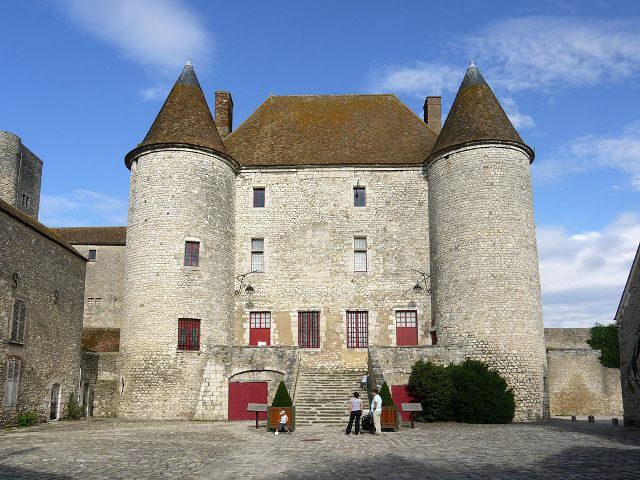 This building is one of the only city of castles managed Île-de-France to us. Unlike the castles built at the same time, he escaped to the dismantling by royalty thanks to the special relationship of the lords of Nemours with it. Turned into Castle Museum Fine Arts in 1903, it houses a rich collection of over 20,000 works. The museum contains a remarkable collection of graphic art (prints and drawings) and photographs as well as paintings and sculptures emblematic of the art of the second half of the nineteenth and early twentieth century. Many donations during the twentieth century have enriched the collection: local archeology, natural sciences, coins, tapestries, pottery essentially revolutionary. The Castle Museum of Nemours been a classification as historical monuments since February 10, 1977 and an inscription since April 14, 1926 for the remains of the old manor chapel. The museum now has the name "Museum of France.The foundations of the building were laid around 1120 by Orson on the left bank of the Loing. A village is built on a nearby hill from the Merovingian period (after the exhumation in 1898 Merovingian sarcophagi) in Saint-Pierre-les-Nemours, left bank of the Loing. The first lords had probably installed a castle mound (wooden) in height on the right bank of the Loing in a place still called "the Chatelet." The establishment of such a structure on the banks of Loing is justified by the presence of a ford that allowed its passage before the construction of a bridge afterwards. In 1170, the second lord of Nemours, Gauthier I Villebéon, chamberlain to Louis VII and Philippe Auguste, gets a charter franchise for his town. During the Hundred Years War, the town was burned in 1359 by the troops of John of Grailly and Thane of Buch. In 1404, the city became a duchy-peerage but it will fall back 16 years later to the English. It will be released from their grip in 1437 by Jacques d'Anjou. The castle will experience little change over the following centuries. It will be rebuilt in the fifteenth century by Jacques d'Armagnac which drill mullion windows to make it more pleasant to live dungeon. During the religious wars between Catholics and Protestants, it is the place of the Treaty of Nemours in 1585 between Catherine de Medici and the Duke of Guise, which confirms the progress of the Catholic League and ordered the Protestants to leave the kingdom before King Henry IV terminates the strife for nearly a century by the Edict of Nantes. In the middle of the seventeenth century, it will enhance an audience of justice during the transition from Anne Hédelin, lieutenant general of the Duke of Orleans. This will also change the castle entrance to open onto the courtyard and monumental staircase.